Balance boards (or less commonly, wobble boards) are available in all kinds of shapes and sizes, but did you know what really matters is the tilt angle and material? Below we have put together this comprehensive guide to choosing the right balance board for your needs, dependent on age, skill level and budget. 1 Balance, Wobble or Rock? 2 What makes a balance board easier or harder to use? 3 Why choose a plastic balance board? 4 Why choose a wooden wobble board? 5 What about rocker boards? Balance boards (less commonly known as wobble boards) are all available with various degrees of tilt angle. They have a dome-shaped base which enables you tip and tilt the board 360 degrees. The use of a balance board can help to retrain your sense of balance after injury preventing further injury and ensuring a speedy return to sport. If the 360 degree movement of a balance board is too challenging consider a rocker board, a rocker boards perform a similar role in exercise and rehabilitation but only allow tilting movement along one axis or direction making them significantly easier to use. 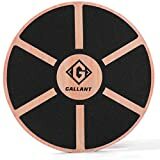 Balance or wobble boards form a useful accompaniment to posture improvement, as well as abdominal and trunk strengthening and increasing tone in the quadriceps, hamstrings and calf muscles. 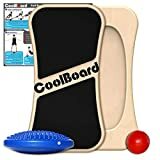 Anyone who suffers with arthritic joints or who has undergone knee surgery (including cartilage and ligament operations) would benefit from using these boards to facilitate proprioceptive re-education. Many other exercises can also be carried out using balance boards including press-ups which help with shoulder stabilisation and strengthening. What makes a balance board easier or harder to use? There are three main factors that can affect how difficult a board is to use, the first being the size of the surface area that the underside of the board has when in contact with the ground. Ultimately, the larger the surface area of the ‘dome’ (that is in contact with the floor) of a wobble board when placed on the ground – the easier it is to use. This is because it has a flatter area and will not ‘wobble’ quite so much. Another factor is the tilt angle. The tilt angle is the greatest angle that the board creates when the user steps onto the board and tips the board so that the edge touches the ground. The bigger the tilt angle the more difficult it is to use, however the level of difficulty is still ultimately determined by the surface area as outlined above. Remember – just because there is a large tilt angle doesn’t necessarily mean that it is very difficult to use! Finally, the third factor can be the size of the wobble/balance board. To a certain extent this is purely down to preference – people with big feet don’t want to be standing on a small board! 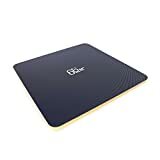 Which Wobble/Balance Board do I choose? Why choose a plastic balance board? These boards tend to be cheaper than wooden ones. 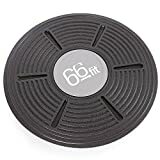 They are more lightweight (a consideration for some people if they need to move the board around) and they usually tend to be easier to use as the majority of plastic wobble/balance boards on the market have larger surface areas. These type wobble boards are normally recommended for children or people who are at the very early stages of rehabilitation. Why choose a wooden wobble board? Wooden boards tend to be slightly more expensive than their plastic or PVC counterparts. They are more robust, stronger and, if well looked after, will last a lifetime. You will find these wooden versions in most physiotherapy departments as they have larger surface areas (normally between 40cm – 50cm) and can withstand heavier user weights. Easy to clean, most have either a PVC or cork surface. The main difference between rocker boards and balance boards is that rocker boards only rock either forwards and backwards, or side to side, depending on how you position the board. 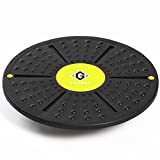 Wobble/Balance Boards, on the other hand, are available with various degrees of tilt angle on a domed base and rock in all directions. 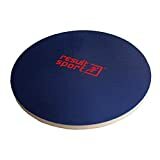 As such Wobble/Balance Boards can help retrain your sense of balance after injury, preventing further injury and ensuring a speedy return to sport. Rocker Boards form a useful tool for posture improvement, as well as abdominal and trunk strengthening and increasing tone in the quadriceps, hamstrings and calf muscles. Anyone who suffers with arthritic joints or who has undergone knee surgery (including cartilage and ligament operations) would benefit from using these boards to facilitate proprioceptive re-education. Many other exercises can also be carried out using wobble/balance boards including press-ups which help with shoulder stabilisation and strengthening. These boards tend made from wood composite, and are widely used in physiotherapy departments. They only rock from side to side or forwards and backwards. Most surface areas measure around 50cm in size. Hopefully we’ve helped steer you in the right direction when it comes to choosing a balance board. If you’re looking for more information on the benefits of using a wobble board here’s a great article from Runners World on that very subject. Alternatively click here for more information on balance training.